Roll out the red carpet for these crispy golden potatoes. This is the first recipe we tried from Andrea Bemis’s new cookbook Dishing Up The Dirt, and we can’t wait to dish up some more gems from her debut book which just came out last month. She knocked it out of the potato park with this one, and we are excited to make it for you today. 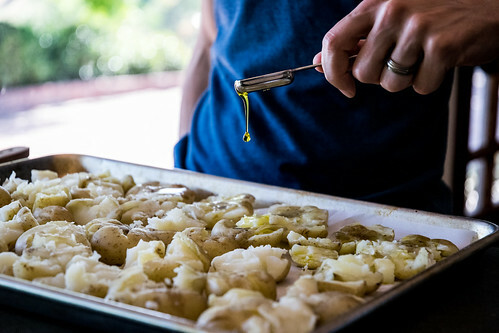 In this versatile dish, baby potatoes are smashed, drizzled with olive oil, and baked in the oven until crunchy on the outside and creamy on the inside. 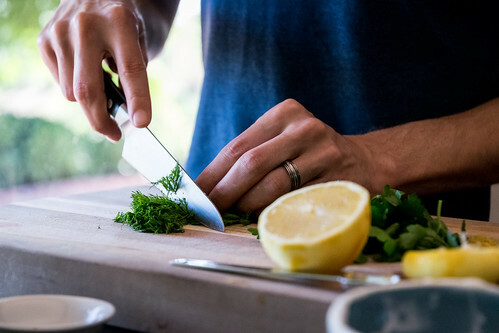 Topped with a zesty herbed yogurt made with garlic, lemon juice, and fresh parsley and dill, it is lightly sweetened with a kiss of honey, and simply seasoned with a few pinches of salt and pepper. To take this appetizer to the next level, make it for breakfast and top it with a fried egg. And some extra lemon and fresh dill, and prepare for a potato party. This dish is easy to make for breakfast, lunch, or dinner. You just boil the potatoes, smash them with a spatula, then bake them in the oven. 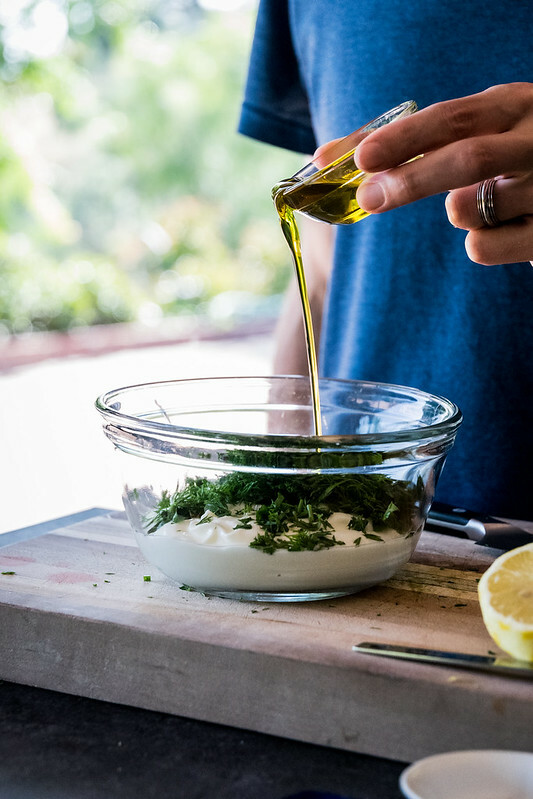 The herbed yogurt dip takes less than 5 minutes to prepare, and can even be made ahead of time. For parties, this recipe can easily be scaled up, and you’ll definitely want to make extra because your guests will be lining up to have a taste. 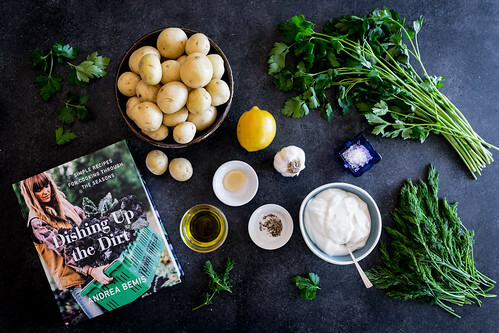 From the very first bite you’ll be in potato paradise, dreaming of the next recipe you’ll want to try from Andrea’s new book. It’s beautifully photographed, the recipes are arranged by season, and we look forward to cooking from it all year long. 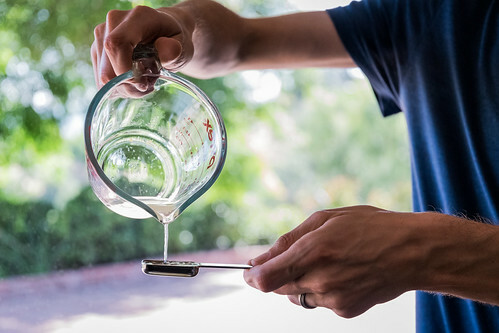 Preheat the oven to 450°F/232°C and line a baking sheet with parchment paper. Place the potatoes in a large deep saucepan, and add enough water to cover them by an inch or two. Add a few pinches of sea salt, place the pan over high heat, and bring to a boil. Lower heat to a simmer and cook until the potatoes are tender when pierced with a knife, but not falling apart, 10 to 12 minutes. 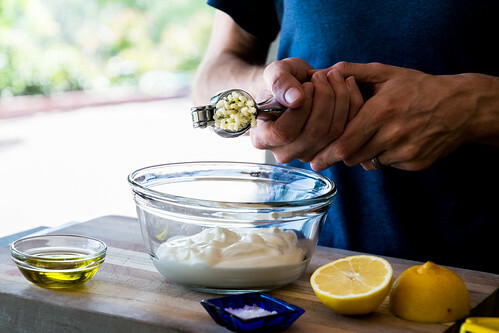 While the potatoes are cooking, prepare the herbed yogurt. In a medium bowl, combine all the ingredients and stir to combine. 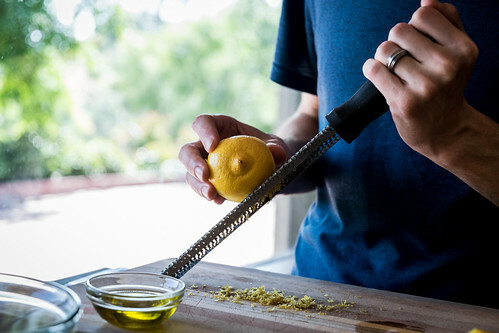 Taste for salt and lemon and adjust as needed. When the potatoes are ready, drain them into a colander, and let rest for 10 minutes. 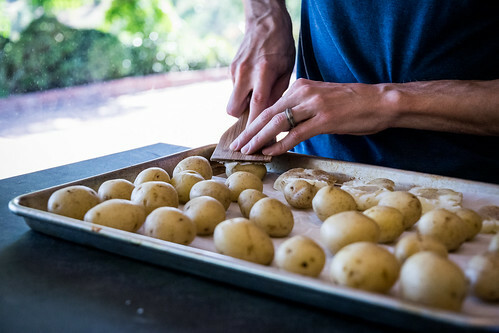 Transfer the potatoes to the prepared baking sheet and spread into one even layer. Use the back of a spatula or wooden spoon to partially smash the potatoes, keeping them intact if possible, but it’s fine if they break apart. Drizzle each potato with about a teaspoon of olive oil, and roast in the oven until crispy and golden underneath, about 30 minutes. 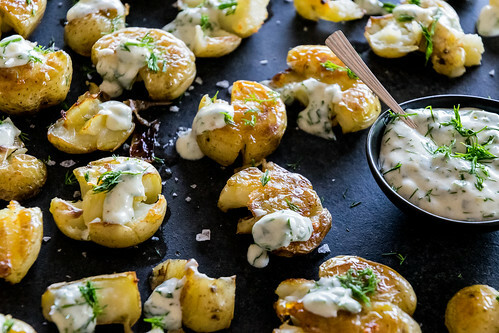 Transfer the potatoes to a serving plate, then finish the potatoes with a sprinkle of flaky sea salt, a small dollop of herbed yogurt, and a pinch of chopped fresh dill on top. Serve hot, and enjoy! 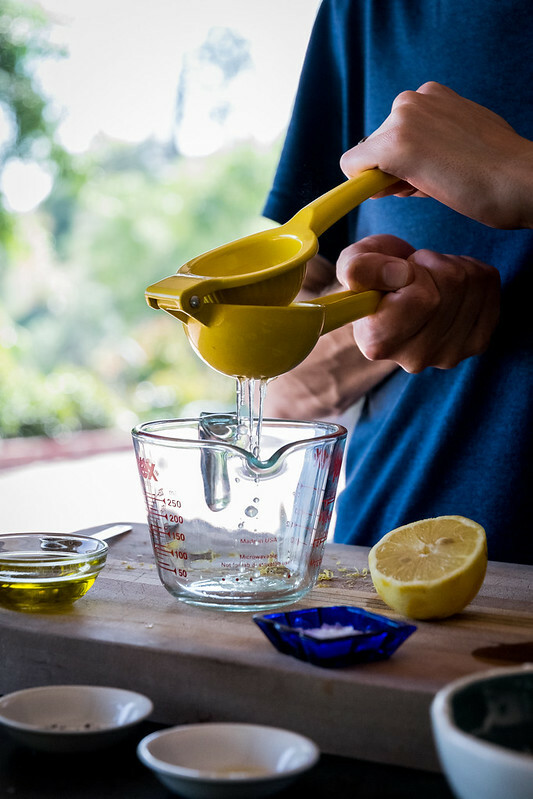 — The yogurt can be made ahead, and will keep fresh for up to a week. I love smashed potatoes, these are absolute perfection! Smashed potatoes are a favorite at our house guys! I love the herbed yogurt on top. Getting these on my list! They’re a favorite over here too! Thanks so much Mary Ann! Hope you have a lovely Easter weekend with your family!